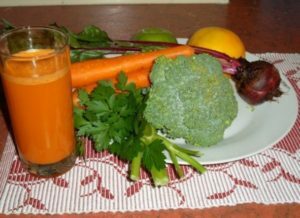 Consider drinking this juice if you have Graves’ disease. One of the helpful hints in my book: ’Thyroid and Graves ’disease unmasked’ is a recipe for a raw vegetable/fruit juice. This juice might help you feel better when you have Grave’s disease. Wash very well, chop up and make juice in a juicer. You can blend them all as well in a blender with addition of some spring water. Parsley: rich in vitamins and minerals such as iron (often depleted in thyroid autoimmunity), it also contain Pyrroloquinoline quinone (PQQ), a molecule which helps with the repair of mitochondria, energy factories of cells. Mitochondrial dysfunction is connected to autoimmunity. Generally, eating any long, green leafy vegetables, in any form would increase methylated folate in the body, which reduces inflammation. Lemon: Provides vitamin C and pectin- vitamin C supports adrenal function (adrenals often show some degree of exhaustion with autoimmunity), repairs iodine transporter in the thyroid gland (which can be dysfunctional), neutralizes excessive free radicals (problem connected with autoimmunity), important for collagen building. It is also vital for a proper synthesis of carnitine, which is essential for transport of fatty acids into the mitochondria to make energy (often depleted in Graves’ disease). It provides pectin (in the skin) for removal of toxins and excessive hormones. Beetroot: it detoxifies liver, helps to remove bad form of estrogen from the liver and oxygenates the blood. Beets are important as they provide body with lots of methyl groups. 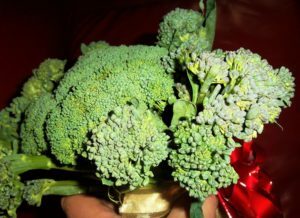 Broccoli is a star vegetable for Graves’ disease. Broccoli and kale are highly goitrogenic foods which slow down thyroid gland, great vegetables for detoxification of excessive hormones. Broccoli is rich in chromium mineral, important for sugar control. It contains uridine diphosphate, a molecule important in balancing of the immune system. Carrots: Contain Beta carotene, which inhibits Bcl-2 gene, switched on in thyroid cells in Graves’ disease and thus balance the immune system, beta carotene is a precursors of vitamin A, often depleted in Graves’ disease. Apple: provides some sweetness, minerals and vitamins and quercentin (in skin) which balances the immune system. Flax seeds: provides essential omega fatty acids and can reduce inflammation and excessive action of thyroid hormone at the nuclear level. Raw juices are great but it is best to start slow with raw juices, and not on an empty stomach. This juice is not suitable for young babies. Some people with previous problems (such as diverticulitis) or after bowel surgery need to be careful with raw juices, especially on empty stomach. Autoimmune Thyroid Disease and gluten. Is there a connection? Our digestive system is like a plants’ root system. If a plant is grown in a barren soil deprived of soil bacteria and nutrients, it will not be healthy. A ‘leaky gut’ allows to filter out undigested larger food molecules instead of just simple fatty acids, amino acids, minerals and vitamins, the building blocks and simple molecules our body needs to function. These simple molecules go through the cell of the intestinal lining into the outside fluid and bloodstream. However when a person has a leaky gut, unwelcome components can pass through spaces between the intestinal cells to the outside. The junctions between the cells of intestinal lining supposed to be tight and nothing should get through between the cells. However in leaky gut some of the junctions are not closed enough. These components can be undigested molecules, toxins and pathogens. About ¾ of our immune system is associated with our gut. This relationship is extremely important as digestive system is the main contributor to the health of our immune system. Leaky gut is associated with autoimmunity problems but not all leaky gut problems cause autoimmune disorders. Genetic components are also important. Gluten sensitivity is linked to a leaky gut and vice versa, a leaky gut can make a person more sensitive to gluten. There are many reasons why a person may have an unhealthy gut. They include: poor nutrition (too much sugar, not enough vegetables, too much processed food), lack of fiber in diet, infections, food poisonings, frequent use of antibiotics, illness (including thyroid autoimmunity and thyroid problems, pancreatic insufficiency, etc. ), certain medications such as NSAIDS (non-steroidal anti-inflammatory drugs such as aspirin or ibuprofen), stress, toxins (such as food chemicals, pesticides, other additives), food allergies and sensitivities such as sensitivity to gluten. A low stomach acid may play a role in how well gluten is digested and the health of the gut. Gluten is a protein, a large molecule composed of amino acids. ‘Gluten’ comes from a Latin language and it means glue. It is what gives dough its elasticity. It is found in gluten containing grains. The proteins in gluten are: prolamines and glutelins, folded and coiled and connected by disulphide bridges. Wheat contains prolamine – gliadin and glutelin- glutenin. The prolamine of rye is secalin, prolamine of barley is hordein and oats is avenin. Allergy to gluten is usually strongest to gliadin (in wheat). Gluten containing food include: wheat bran, wheat, rye, barley (both whole grains and flours) and oats. Wheat flour white bread, cakes, pastries and pasta contain high amounts of gliadin. It is also found as a filler in many products. Modern wheat is different to the wheat our ancestors ate. It has been hybridized and selected for higher yields. The modern farming technology involves using pesticides and fertilizers and bleaching the flour. The flour our ancestors ate was organic, grind whole and unbleached. There are questions regarding the effects of modern wheat on our health which are still awaiting clear answers. Nevertheless, some people are sensitive to gluten containing products. Good gluten free grains are: brown/white rice, buckwheat, quinoa and amaranth. Quinoa contains lots of iron and methylated folate, which is beneficial. Gluten is a complex molecule, which is difficult to digest as some of the bonds between amino acids in gluten are uncommonly seen in other proteins. Some sections of undigested gluten can have immuno-modulatory activities in individual people. Some people are able to dispose of the undigested parts of gluten through their gut easier than others. They can also digest it better. There are individuals in which their overall health is strongly impacted by their gastrointestinal system and it is the key for their well being. There is an enzyme in human cells called transglutaminase. It is important for linking proteins to collagen in extracellular matrix (outside of cells). Gliadin molecule in gluten looks similar to transglutaminase enzyme and can confuse the immune system in genetically predisposed people. This may result in Coeliac Disease where antibodies to transglutaminase and components of collagen (what holds cells together) are generated. Gluten, especially gliadin part also shares similarity to thyroid molecules. Therefore, when leaky gut is present, the immune system of genetically predisposed individual can get confused and generate faulty antibodies to thyroid tissues. Also, the auto-antibodies directed against transglutaminase (anti-TGase II antibodies) bind to thyroid cells and the collagen components outside of the thyroid cells and thus could be implicated directly in thyroid autoimmunity which can explain an increased correlation of Coeliac Disease and thyroid autoimmunity. 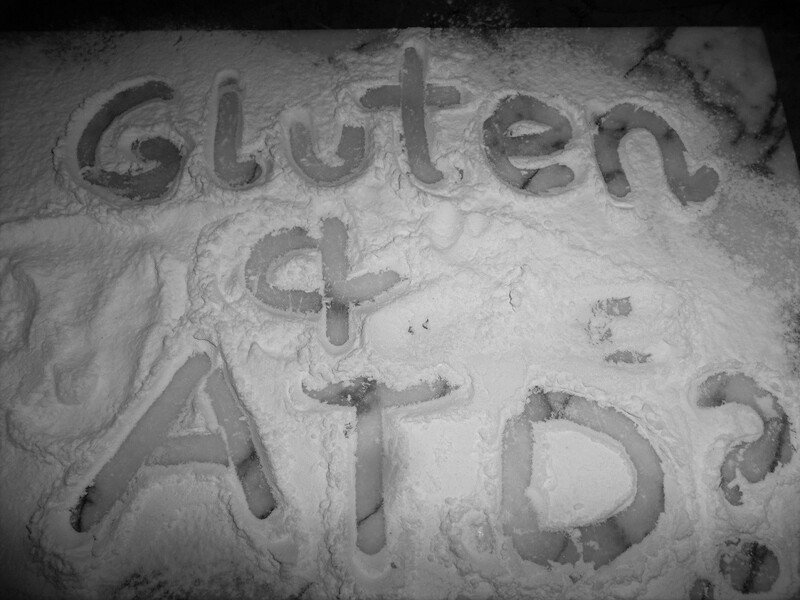 Gluten sensitivity is associated with Hashimoto’s thyroiditis and Graves’ Disease and other autoimmune disorders. Gluten sensitivity seems to be more strongly associated with Hashimoto’s thyroiditis than Graves’ Disease. Apart from possible gluten sensitivity, casein in cow’ milk products may be a problem for people with thyroid autoimmunity. It seem to be more strongly connected to Grave’s Disease. 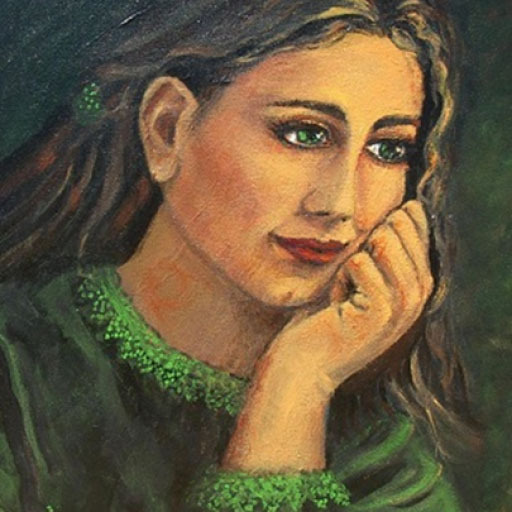 Coeliac disease (CD) is an autoimmune disorder, severe allergy to gluten with auto- antibodies to tissue components which can damage intestinal finger-like projections (villi) which absorb nutrients from food. It can co-occur with thyroid autoimmunity. Coeliac disease may sometimes precede thyroid autoimmunity. The links between autoimmune thyroid disease and Coeliac Disease were shown in many scientific research studies (1, 2, 3, and 4). The immune system in people with autoimmunity in general shares common genetic components and can get confused easier. The presence of Coeliac Disease in patients with Autoimmune Thyroid Disorder ranged from 3.3% – 5.5%. There were also few cases of laboratory diagnosis of Coeliac Disease in Autoimmune Thyroid Patients who did not have symptoms of Coeliac Disease (4). The presence of Autoimmune Thyroid Disease was also 11.8% higher in coeliac patients when compared to controls in a study (4). It is worth mentioning that the diagnosis of Coeliac Disease requires more tests than blood anti-gliadin antibody test. This test is not 100%. Stool analysis is one more sensitive method to detect antibodies produced in the digestive tract rather than blood. Dr. Kenneth Fine at the Intestinal Health Institute had shown that a high percentage of his patients had IgA anti-gliadin antibodies in stool samples and not in blood, 60% and 75% positive versus 11% in the blood (7). Some asymptomatic people have these antibodies. Tissue biopsy and antibody testing to tissue components such as anti-endomysial antibodies or EMA and transglutaminase autoantibodies (TGAA) confirms CD diagnosis. Patients need to be on a gluten containing diet at the time of testing. It may be beneficial to get tested for Coeliac Disease if you experience a lot of gastrointestinal issues. Coeliac Disease affects 1 in 70 Australians but many others may be not be diagnosed because many symptoms can be unrecognized and some people may be asymptomatic as mentioned before, perhaps in early stages of an illness. Genetic screening for the HLA DQ2/8 gene (present in a half of population) can also be a useful test especially with a family history of an illness. People not carrying this gene are very unlikely to have Coeliac disease. People with Coeliac Disease cannot have any gluten in their food. They need to have gluten-free grains like rice or quinoa, otherwise they get very sick and have symptoms such as bloating, irritable bowel, diarrhea, constipation, gas, abdominal pain, nausea, joint and muscle pain, headaches, skin rashes, tiredness, brain fog, sleep disturbances, anxiety, depression, iron deficiency and emotional issues. In Coeliac Disease secretory IgA antibody binds gliadin and transports it on the outside of the intestinal cell. The immune system generates antibodies to gliadin (in gluten) and the connective tissue in the gut (endomysium), specifically tissue transglutaminase or tTg (also abbreviated as TG2 or TG). However one does not need to have Coeliac Disease, antibodies and classical changes in gut villi to be sensitive to gluten. Negative coeliac panel tests do not necessary mean that a person is not sensitive to gluten. People with autoimmune thyroid illness may not have Coeliac Disease (as it only co –occurs in about 3-5% of people with thyroid autoimmunity), they may just be sensitive to gluten. Allergic and autoimmune reactions are not present in gluten sensitivity. A study reported that about 6.8% of population were diagnosed in Non-Coeliac Gluten Sensitivity –NCGS (15). More specifically, patients have negative serological tests for Coeliac Disease (endomysial and/or tissue transglutaminase antibodies) but antigliadin antibodies may be present. They may have other antibodies to various wheat and tissue components (15, 17). This was demonstrated in a patient with Crohn’s Disease (17) who also had NCGS. The immune system mechanisms of gluten sensitivity are not clearly understood. People with gluten sensitivity may also have symptoms triggered by other molecules present in rye or barley. This sensitivity may possibly be connected to stress, toxins, low stomach acid, hormonal imbalances and other factors. People who are sensitive to gluten might have symptoms similar to Irritable Bowel Syndrome. They might experience discomfort, gas and burping after they eat gluten containing food. A research study showed that heartburn, stomach ulcers, GERD may be linked to gluten sensitivity. Complete stool diagnostic test can determine the health of the digestive system. Dr. Alessio Fasano, a leading expert in Celiac Research and Gastroenterology has done a lot of research into non-celiac gluten sensitivity. It was noted by Dr Fasano and other health practitioners that people with IBS (Irritable Bowel Syndrome) like symptoms such as bloating, abdominal pain, constipation and diarrhea and no Coeliac Disease improved their gastrointestinal symptoms on a gluten free diet. Some people report feeling generally better and happier as gluten sensitivity may affect brain and other tissues. People, sensitive to gluten, have an immune response to undigested parts of gluten molecules, which causes inflammation although exact mechanism are yet to be understood. The nervous system influences the permeability of tight junctions to macromolecules, thus modifying mucosal barrier of the digestive system through neuropeptides. Thus stress plays a big role in the gastrointestinal health. It is important to have a balanced but flora. The beneficial bacteria in our gut ‘educate’ the immune system how to function properly. A healthy gut flora reduces the over-activity to some food antigens and prevents allergies. Gluten intolerance can cause low levels of diamine oxidase (DAO) in the digestive system, which breaks down histamine. Histamine is an immune system modulating molecule, which causes an immediate inflammatory response. The intestinal lining can become more permeable to certain toxic molecules, which leak through it and enter the blood system. Inflammatory molecules can be released as a reaction to gluten sensitivity, opening passages between the cells of gastrointestinal tract, allowing toxic molecules to leak through these passages. Dr. Alessio Fasano and his team of researchers had discovered a molecule called zonulin (10), a protein that can be triggered by gluten and other molecules, which is expressed in all autoimmune conditions and is associated with leaky gut. Dr. Fasano’s and his research team are working on a new medication which inhibits zonulin. Gluten sensitivity may play a big part in some people. As mentioned previously, the gut is closely connected to the immune system and as gluten can mimic some molecules of the thyroid, subsequent attack on thyroid attack is possible. Personally, I do not have Coeliac Disease. I was tested for blood anti-gliadin antibodies when I had experienced a lot of IBS like symptoms while on sub optimal thyroid hormonal treatment after my thyroid removal. This is not surprising as the luck of T3 hormone creates lots of negative effects on the gastrointestinal system. Without adequate T3 a person suffers from a low stomach acid and poor digestion of proteins such as gluten. People with a low stomach acid can have vitamin B12 or iron deficiency. My issues subsided with the introduction of Natural desiccated thyroid to my levothyroxine hormonal replacement. I was skeptical in regards to gluten for years until my integrative doctor suggested to try to lower my inflammation levels by avoidance of gluten. I thought that it is possible that I may have gluten sensitivity and a gluten free trial would help me determine that. I had gone on a complete gluten free diet for six months and I did see improvements in my well- being, less bloating, better digestion and feeling better. The markers of my inflammation had decreased (anti-nuclear antibodies- ANA). When people lower their inflammation, T3 hormone works better in their body. However I am not sure if the markers of inflammation went down specifically due to gluten as I had made some other positive changes. I personally feel that I am more sensitive to cow’s milk products than wheat. These days, I am still limiting gluten products and a light gluten exposure works for me. I feel better when I limit gluten and will continue to do so. One of the important observation derived diet tips for Hashimoto’s thyroiditis and Graves’ disease suggested in literature is the avoidance of gluten. It was found in a study (12) that gluten withdrawal may in distinct cases, reverse thyroid abnormality. Apart from thyroid autoimmunity, some people who have coeliac disease may also suffer from sub clinical non-immune hypothyroidism which may be due to malabsorption of nutrients. Bone broths, foods containing gelatin, organic food which includes lots of vegetables, apple cider vinegar, fermented vegetables and stress reduction may also improve the health of gastrointestinal system. It is also important to avoid any other food your body reacts negatively to. Speak to your doctor if you have any digestive issues. Pekka Collin, Jorma Salmi, Olavi Hällström, Timo Reunala and Amos Pasternack. Autoimmune thyroid disorders and coeliac disease. Eur J Endocrinol 1994; 130:137–40. Akçay MN, Akçay G. Hepatogastroenterology. The presence of the antigliadin antibodies in autoimmune thyroid diseases. 2003 Dec; 50 Suppl 2. Chin Lye Ch’ng, MRCPI, M. Keston Jones, MD, FRCP, and Jeremy G. C. Kingham, MD, FRCP. Celiac Disease and Autoimmune Thyroid Disease. Clin Med Res. 2007 Oct; 5(3): 184–192. Sategna-Guidetti C, Bruno M, Mazza E, Carlino A, Predebon S, Tagliabue M, Brossa C. Autoimmune thyroid diseases and coeliac disease. Eur J Gastroenterol Hepatol. 1998 Nov; 10(11):927-31. Hakanen M, Luotola K, Salmi J, Laippala P, Kaukinen K, Collin P. Clinical and subclinical autoimmune thyroid disease in adult celiac disease. Dig Dis Sci. 2001 Dec; 46(12):2631-5. Ruuskanen A, Kaukinen K, Collin P, Huhtala H, Valve R, Mäki M, Luostarinen L. Positive serum antigliadin antibodies without celiac disease in the elderly population: does it matter? Scand J Gastroenterol.2010 Oct; 45(10):1197-202. Carlo Catassi and Alessio Fasano. Tempters and Gluten- Free Diet. Nutrients. 2016 Dec; 8(12): 786. Fasano A. Leaky Gut and autoimmune disease. Clin Rev Allergy Immunol. 2012 Feb; 42(1):71-8. Fasano A. Zonulin and Its Regulation of Intestinal Barrier Function: The Biological Door to Inflammation, Autoimmunity, and Cancer. Physiol Rev. Vol 91. Jan 2011. 151-175. Naiyer AJ, Shah J, Hernandez L, Kim SY, Ciaccio EJ, Cheng J, Manavalan S, Bhagat G, Green PH. Tissue transglutaminase antibodies in individuals with celiac disease bind to thyroid follicles and extracellular matrix and may contribute to thyroid dysfunction. Thyroid. 2008 Nov; 18(11):1171-8. Sategna-Guidetti C, Volta U, Ciacci C, Usai P, Carlino A, De Franceschi L, Camera A, Pelli A, Brossa C. Prevalence of thyroid disorders in untreated adult celiac disease patients and effect of gluten withdrawal: an Italian multicenter study. The American Journal of Gastroenterology. 2001; 96(3): 751–757. Carlo Catassi, Julio C. Bai, Bruno Bonaz, Gerd Bouma, Antonio Calabrò, Antonio Carroccio, Gemma Castillejo, Carolina Ciacci, Fernanda Cristofori, Jernej Dolinsek, Ruggiero Francavilla, Luca Elli, Peter Green, Wolfgang Holtmeier, Peter Koehler, Sibylle Koletzko, Christof Meinhold, David Sanders, Michael Schumann, Detlef Schuppan, Reiner Ullrich, Andreas Vécsei, Umberto Volta, Victor Zevallos, Anna Sapone, and Alessio Fasano. Non-Celiac Gluten Sensitivity: The New Frontier of Gluten Related Disorders. Nutrients. 2013 Oct; 5(10): 3839–3853. Geoffrey Holmes. Non coeliac gluten sensitivity. Gastroenterol Hepatol Bed Bench. 2013 Summer; 6(3): 115–119. Capannolo A, Viscido A, Barkad MA, Valerii G, Ciccone F, Melideo D, Frieri G, Latella G. Non-Celiac Gluten Sensitivity among Patients Perceiving Gluten-Related Symptoms. Digestion. 2015; 92(1):8-13. Imran Aziz and David S. Sanders (2012). Emerging concepts: from coeliac disease to non-coeliac gluten sensitivity. Proceedings of the Nutrition Society, 71, pp 576-580. Grain brain David Perlmutter, MD. Little, Brown and Company. Hachette Book Group. 2013 New York. 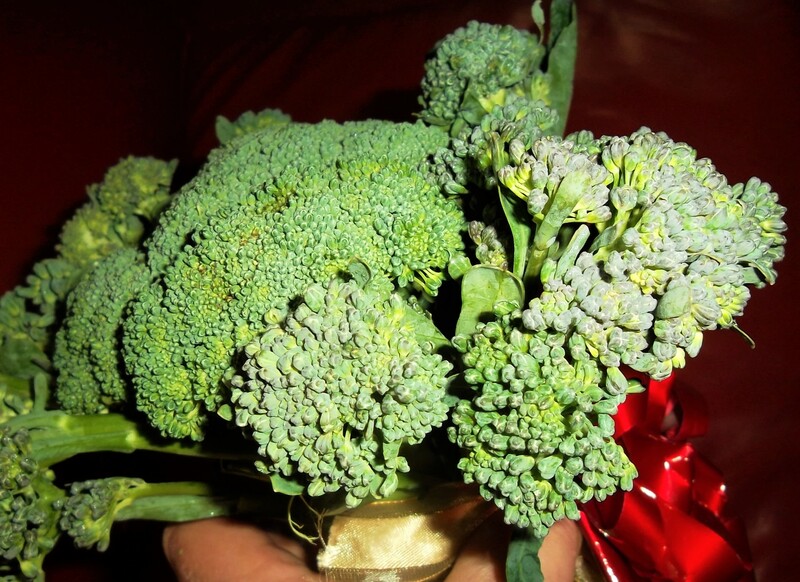 What broccoli, thyroid and taste have in common? Cruciferous vegetables such as broccoli, cabbage, broccolini, mustard greens, cauliflower, kohlrabi, turnip, radish, kale and watercress are great for us. We should include them in our diet. They have many beneficial health effects as they contains plenty of beneficial nutrients, have detoxifying and anti-carcinogenic effects. Cruciferous vegetables are very important for glutathione function (important detoxifying molecule) and removal of many toxins from the body, including heavy metals. Most cruciferous vegetables are also mild goitrogens. They contain compounds such as isoflavones and isothiocyanates. Those molecules are natural mild thyroid inhibitors with action similar to antithyroid medications used for hyperthyroidism. Goitrogenic food normally does not hamper the thyroid hormone production in healthy individuals. However, in excessive amounts, believed to be more than two cups a day of raw food, they can slow down the thyroid function. People with a sluggish thyroid may be affected when consuming high amounts of goitrogenic vegetables (especially raw ones) especially if they do not have enough iodine in their diet. Cooking these foods destroys most of the antithyroid chemical. However they would still benefit from having some cruciferous foods, just not in excessive amounts. Those with sluggish thyroid should have adequate iodine levels. People with Graves’ disease may benefit from eating goitrogenic vegetables. As these vegetables work mildly like antithyroid medications, people who take antithyroid medications might need a lower dose of medication when consuming high amounts (about two cups per day) of raw goitrogenic food. Eating more goitrogens may be used as a remedy to improve symptoms of Graves’ disease. Some goitrogenic food like broccoli induces the enzyme CYP1A, which is involved in metabolising the active vitamin D3 and estrogen, which might benefit someone with GD. CYP1A enzyme might be down regulated in a Graves’ disease process. I came across the comparison of goitrogenic foods in some literature to double edged sword as you might lower the production of thyroid hormones but enlarge the thyroid gland. Therefore over excessive and long term overeating of these foods might backfire. However during periods of hyperthyroidism it may be beneficial to increase consumption of goitrogenic foods. Speak to your doctor regarding those issues and changes to your diet. Goitrogenic food competes with thyroid gland with the uptake of iodine from the blood. The compounds in goitrogenic food bind to NIS receptor on thyroid cells and prevent iodine transport into those cells. Iodine is essential for thyroid hormone production. For example, highly goitrogenic food like cassava root and cassava flour, consumed in high amounts in Africa was shown to interfere with the thyroid function. When goitrogenic foods are chewed, Indole-3-Carbinol, glucose, and thiocyanate ion are generated. Indole-3-carbinol is broken down in the body to Diindolylmethane (DIM), which might help with oestrogen and thyroid hormone metabolism in peripheral tissues by lowering aromatase enzyme activity and thus might help in a relative androgen deficiency and estradiol excess, which is sometimes found in autoimmune disorders. Increased aromatase activity in Graves’ disease may cause Gynecomastia (enlarged breasts) in men and DIM from cruciferous vegetables may help. Other natural aromatase inhibitors are: passionflower tea, chamomile, quercentin, flaxseed oil, lemons, oranges, olive leaf extract and red wine (or red grapes). DIM (Diindolylmethane) is available as supplement. However, there are no scientific studies done on the use of DIM for Graves’ disease and therefore at the present time it’s too early to talk about its benefits vs. risks in regards to this illness. Other goitrogenic foods include: Brussels sprouts, celery, corn, horseradish, peanuts, almonds, millet, pine nuts, bamboo shoots, sweet potatoes, lima beans, cassava and walnuts. There are cruciferous food powder concentrates on the market, which can be used in drinks or added to shakes and juices. This may make it easier for some people. Mildly goitrogenic food examples include spinach, strawberries, peaches, apricots, cherries and pears. It is best to pick cruciferous food you can tolerate as some people may experience bloating or digestive discomfort with some cruciferous foods such as broccoli or cabbage. PTC (phenylthiocarbamide) is a goitrogenic like substance and PTC- like chemicals are present in goitrogenic foods. It is often used in genetic traits studies at schools in a form of taste paper saturated in PTC. There are PTC taste papers available on the market. Some people taste PTC strongly (very bitter), some mildly (slightly bitter) and others report no taste at all. The trait of tasters or non-tasters of PTC is genetically inherited and believed to be connected to HLA genes. Those genes are also involved in autoimmunity predisposition. I found it interesting that there are much more PTC tasters amongst people with Graves’ disease and they can taste lower levels of (PTC) than people with other type of hyperthyroidism (1, 2). On the other hand, people with hypothyroidism tend to be non-tasters. Perhaps, people who can taste bitterness of some goitrogenic compounds have enormous benefits from eating those goitrogenic foods. I can taste PTC. The trait of PTC taster or non-taster may perhaps be some indication of the predisposition to GD. Our bodies are amazing. Our taste, food preferences, its benefits for our individual health and genetic are all connected. F. D. Kitchin, W. Howel-Evans, C. A. Clarke, R. B. McConnell and P. M.Sheppard. P.T.C. Taste response and thyroid disease. Br. Med J. 1959 Apr;1(5129):1069-1074. Farid NR, Barnard JM, Bryant DG. HLA and phenylthiocarbamide (PTC) tasting in autoimmune thyroid disease. Tissue Antigens. 1977 Nov;10(5):414-6. L-carnitine is an amino acid that is very important for energy production and fat metabolism and it is often depleted in hyperthyroidism. It helps to carry fatty acids into mitochondria, the energy houses of cells. L-carnitine, known as acetyl-L-carnitine or carnitine, is synthesised in the liver, kidney and brain and then transported to other areas of the body. It is also present in some foods like red meat and avocado. In order for carnitine to be made in the body, essential amino acids, such as lysine, methionine, vitamins: B3 (niacin), B6 and iron are required. It is possible that vitamin B3 may be depleted in people with leaky gut problems and digestive problems (common with autoimmunity) as vitamin B3 and amino acid- tryptophan are not well absorbed. Tryptophan is used for vitamin B3 and serotonin production (the happy hormone) in the body. In fact Graves’ disease may be triggered by diets low in tryptophan, as was shown in animal studies (2). People with Graves’ disease need to have adequate protein (as proteins are made up of amino acids) and fats in their diet. L tryptophan is an essential amino acid, present in high protein foods such as nuts, seeds, egg whites, cheese, red meat, chicken, turkey, fish, oats, beans and lentils. Therefore, indirectly, leaky gut, digestive issues and a low protein (and low tryptophan) diet may be related to a low L-carnitine level. L- carnitine may help with Graves’ disease. A scientific trial involving fifty women found carnitine to be effective in reversing and preventing the symptoms of hyperthyroidism (1). Its action seems to be similar to antithyroid drugs. Carnitine may inhibit the passage of thyroid hormone into the nucleus or it can interfere with the action of excessive T3 at the nuclear receptor. It seemed to be a very important nutrient in the methylation processes of the body. There is indication that an aberrant methylation process may play a role in the development of GD. The usual dose of L-carnitine is 500-2,000mg/day. It is available in tablet or liquid form and can be easily obtained as a supplement without a medical prescription. Some people take L-carnitine with their antithyroid medications but it is best done under a medical supervision as lower doses of antithyroid medication may be needed when taking L-carnitine. Consult your doctor before using L- carnitine as it needs to be used with caution when taking anticoagulants (blood thinners), beta-blockers, or calcium channel blockers as well as in certain medical conditions. Avoid if pregnant or breastfeeding and with a known allergy or hypersensitivity to carnitine. Benvenga S, Ruggeri RM, Russo A, Lapa D, Campenni A, Trimarchi F. Usefulness of L-carnitine, a naturally occurring peripheral antagonist of thyroid hormone action, in iatrogenic hyperthyroidism: a randomized, double-blind, placebo-controlled clinical trial. J Clin Endocrinol Metab. 2001 Aug. 86(8):3579-94. Carew, L.B. Jr, Alster, FA, Foss, DC and Scanes CG. Effect of tryptophan deficiency on thyroid gland, growth hormone and testicular functions in chickens. J. Nutr. 1983 Sep; 113(9):1756-65.